Typedef for a set of WTreeNode's. Returns the set of selected tree nodes. Sets a selection of tree nodes. Selects or unselect the given node. Returns if the given node is currently selected. Signal that is emitted when the selection changes. A widget that represents a navigatable tree. WTree provides a tree widget, and coordinates selection functionality. 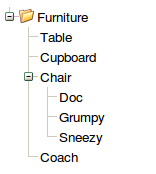 Unlike the MVC-based WTreeView, the tree renders a widget hierarchy, rather than a hierarhical standard model. This provides extra flexibility (as any widget can be used as contents), at the cost of server-side, client-side and bandwidth resources (especially for large tree tables). 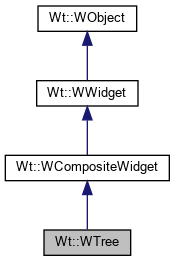 The tree is implemented as a hierarchy of WTreeNode widgets. Selection is rendered by calling WTreeNode::renderSelected(bool). Only tree nodes that are selectable may participate in the selection. The default selection mode is Wt::NoSelection. Sets the tree root node.